The Composer Pro with Edge 80 puts tilt-shift effects at the tip of your fingers. When used in the Composer Pro, the Edge 80's flat field of focus optic takes on a new life. Simply tilt the Composer Pro to create a crisp slice of focus through your image. The Composer Pro's metal swivel ball design and ultra-smooth manual focusing ring delivers precise, fluid control over the tilt and placement of your slice of focus. 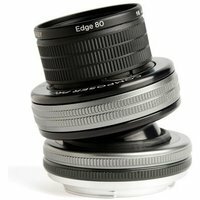 The Edge 80, an 80mm, f/2.8 flat field of focus optic features internal aperture blades making it easy to widen or narrow your slice of focus while you're shooting to get a similar effect like a tilt-shift lens. Incredibly versatile, choosing not to tilt the lens will make spectacular 'straight' photos - just as you'd get shooting with a 'normal' 80mm lens.